Blindspot #2 consists of three short vignettes and one extended narrative, all of which seem to revolve around the themes of the struggle of creation and the consequences inherent in that process. These two stories are then followed by “Lip Candy featuring Bill Wilkinson” a 22-page tour-de-force exploring failure. Each one of these stories have abject moments of palpable pathos. They descend into stomach tightening expressions of the loathing an artist can feel toward an unappreciative audience and the toll that takes on the creator. And yet in each of these stories, Remnant ends them with the creator returning to his art, picking up the guitar, walking back into the office, starting again. Remnant's Blindspot is, as its title suggests, an ode to the fortitude of the creative soul. It celebrates the ability of the artist to create a blindspot to an indifferent audience and to keep creating. In “Delusions of Grandeur,” it is one obscure praise that brings the artist back to his creative urge. In “Lip Candy,” it is the individual himself who blinds himself to all his failures and strides back into the fray. The final vignette, “Juan the Security Guard” sums up what could be the overarching theme of the book. Happiness is found in self-contentment, being comfortable with who you are and how you live your life. Joseph Remnant has put together a collection that, even in its misery, is a celebration of the independent spirit. Blindspot #2 is the kind of comic that understands that every day there are forces out there that will push you in the mud, but it is also the kind of comic that puts you back on your feet. 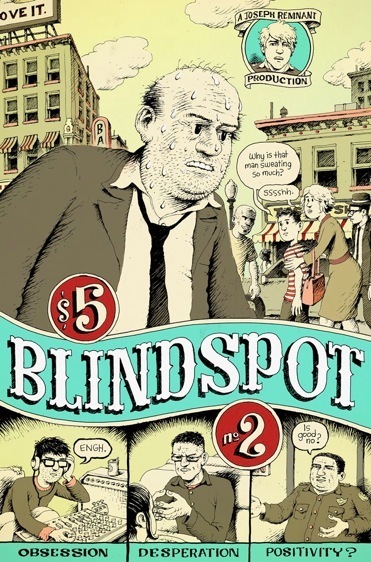 You can purchase a copy of Blindspot #2 from Indy Planet and check out Joseph Remnant'swebsite.